As a founding member of iconic synthpop group Depeche Mode, Martin Gore supplied the creative muscle behind much of the band’s material for over three decades. But, as he told Electronic Beats’ Max Dax from his home base in Santa Barbara, California, many of his instrumentals will never make it into Depeche Mode’s official catalog or that of VCMG, his project with bandmate Vince Clark. Instead, the overflow has surfaced on MG, Gore’s new 16-track solo album, which he describes as sci-fi inspired and purely synthetic. The album is due out on April 27/28 via Mute. On April 22nd, Gore made MG available for advance listens via Ustream until the morning hours. Unfortunately you are a bit late to the party and will have to wait until next week’s release. To bridge the wait, read on for Gore’s thoughts on science fiction, creative exhaustion while touring, and more. Hi Martin. Your new solo record MG is an instrumental album that seems to draw heavily from science fiction. That’s well observed. I like science fiction, and I especially like science fiction films. What are your favorite sci-fi films and books? Do you prefer Russian, Polish, British or American works? They all have a different mindset, don’t they? I didn’t really specialize in a specific sub-genre of sci-fi, to be honest. I didn’t even start off with that concept in mind. When I was writing songs for Depeche Mode’s Delta Machine, I mapped out four or five instrumentals that we didn’t use on the album or on the deluxe edition because we had too much material. Have you been more productive lately than usual? No. David [Gahan] is writing for the band as well, so we just had too many songs and there wasn’t enough space for all the instrumentals, and for a while I didn’t really know what to do with them. Then a friend suggested to me to record an instrumental record where I could use these song orphans. I hadn’t really considered doing an instrumental album but I immediately liked the idea. I always liked to do things that I’ve never done before and to explore new musical territory. So I pretty much went straight into the studio and started recording new music the moment I got back from the Delta Machine tour. It was only after I had already arranged a few tracks that I started to think about the science fiction element. The imagery that I visualized was definitely inspired by science fiction, and I realized that I should keep that in the back of my mind while recording the rest of the album. Science fiction fans usually fall into one of two factions: those who admire the Russian filmmaker Andrei Tarkovsky, who shot Solaris in 1972, or those who love Stanley Kubrick’s 1968 film 2001: A Space Odyssey. Both films basically mirror one another. I didn’t really get that specific with it. Could you then describe what you mean when you use the term “science fiction”? It was just very loose and very vague, you know? If I close my eyes while listening to the music on MG, I imagine astronauts or spaceships drifting around in space. Jupiter and beyond the infinite? Yeah, that kind of thing, yeah. What about Ridley Scott’s Blade Runner? You live in Santa Barbara, and Blade Runner is probably the penultimate sci-fi film about L.A.
You know what? I do like the rain in Blade Runner. It also rains in Solaris. Yeah, but we’re suffering terribly from water shortage in California right now. I recently watched Blade Runner with my 12-year-old son. I wanted to show him the American sci-fi classics like Terminator, Terminator 2 and Total Recall because he’s at an age where all of that is really exciting. Do you and your son talk about the films you watch after you finish them? Yeah, a bit. I think he just loves them as adventure films. Would you fancy the idea that the music on MG would be used as a score in a future science fiction film? Did you have a cinematographic use in mind? I like the idea that somebody could listen to it and like it and go: “Oh that could work in a film that I am making.” It may happen, it may not. You mentioned that you wrote MG after finishing the last world tour with Depeche Mode. I spoke to Warren Ellis of The Bad Seeds the other day, and he told me that after every tour he kind of falls into a hole and has to recalibrate, because playing shows every night is so different from daily life. Did you start working on a new project immediately as an act of self-preservation or rejuvenation? In the past, coming back from touring was more difficult for me than it is today. I’ve had times when I’ve found it very difficult to adjust to normal life after a tour, but that’s changed. I found it a lot easier to fall back into a normal routine after our last few tours, and I think that going to the studio every day does help, because you can’t work when you’re on tour. Every time, I fool myself into thinking that I’m actually going to write while I’m on the road—like after a show or on a day off—so I get a set-up in my room. I carry the gear around with me for months, and eventually I realize that it’s never coming out! When you’re in the middle of a tour and playing every other day, the last thing you want to do is immerse yourself in more music and try to be creative. I find it extremely hard to be creative while slogging through a tour. You’ve been on tour many times. Does that lifestyle become routine, or does every tour have its own “smell” or conditions? 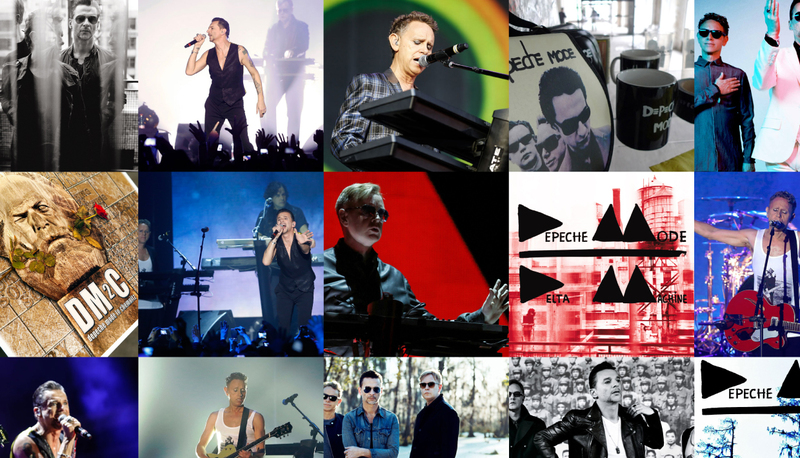 In that sense, how would you describe the Delta Machine tour? A tour is a lot of fun—at least, that’s the way I see it. I really enjoy touring, and being on stage is a great feeling, but it’s also hard work. On the Delta Machine tour we played pretty much every other day for long stretches. On our days off we would travel to the next place. You don’t get into the city you’re playing until about 6 p.m., and that’s when you get to eat dinner. The last thing you want to do at that point is get your computer out, set some speakers up, and then start working. It just never happens. It’s a different life pattern. Yes. It’s just a different lifestyle, and it’s not conducive to being creative. Still, it’s quite good to have a long stretch of time without being very creative, because when you then get back to your studio you can tap a reserve of creativity that’s been bottled up inside you. The album Delta Machine was based on modular synthesis, but it also had this extraordinary blues feel, and I think that the Delta vocabulary comes from the Delta blues. Yet MG lacks blues patterns. In that sense, maybe it was good that the instrumentals didn’t make it onto the Delta Machine record, as they would have stuck out. When I started writing the album in earnest, I had this idea that I wanted to keep it very pure and electronic. Unlike the tracks that I wrote for Delta Machine, I never once thought about picking up a guitar or using any real instrument to make sounds. In hindsight that would have been completely wrong, and I also knew that I didn’t want to have any vocals on it. I just wanted to keep the tracks very synthetic. The songs that I had written during the Delta Machine sessions were already more than sketches, so I just wanted to carry on. It just wasn’t right to be using guitars and real drum sounds and things like that. Which were the songs that you had written before? I wrote “Elk,” “Brink” and “Featherlight” during that period. It’s interesting that the names you gave the tracks influenced their identity. I wanted to give them names that meant something to me. They don’t necessarily have to mean anything to anyone else. It’s a bit like a song with lyrics: it’s good when you name a song and then let people use their imagination. One word can send you on a trail thinking about what a song could possibly be about. All the track titles mean something specific to me, but it would take away all the mystery if I told you more about them. OK, so I won’t get too specific, but could you elaborate a bit on the track name “Europa Hymn”? It’s the only title that’s not cryptic or dream-like; it’s pretty precise. Why did your album need a “Europa Hymn”? Well, as I said, I’m not going to tell you exactly why I named it that, but I thought that it could lead to something if Europeans started thinking about something aligning. You’re from the U.K. but now live in the U.S. Has that changed your perspective? I’m not sure. I like living here because it feels a bit remote from Europe. I think Californians fancy a very healthy lifestyle, and that probably helps somehow—but I doubt that different songs or thoughts would come out from my inner soul if I wrote my music in Dresden or elsewhere. Do you have a strict routine when you work on music? Do you wake up, have breakfast then go to your studio and write? Yes, that’s me. Every day I get up and then I go to the studio. Most days I start by about 11 a.m. or noon12 a.m., and usually I finish by about 6 or 7 p.m. So you’re not a late-night worker like you used to be? Not when I write. Since MG is a solo album, it was a more relaxed kind of work pattern compared to writing and recording songs with the band. As a band we obviously work late nights, but that’s a completely different thing because working on a Depeche Mode album is a much bigger project. We’ve got a team and an expensive studio, so it just seems a waste to finish work at 6 p.m.